New belts on my cable holders - THE PORTAL HUB - Pinzgauers, Haflingers, Volvo 303s and more! Petsmart has leather dog collars cheap. 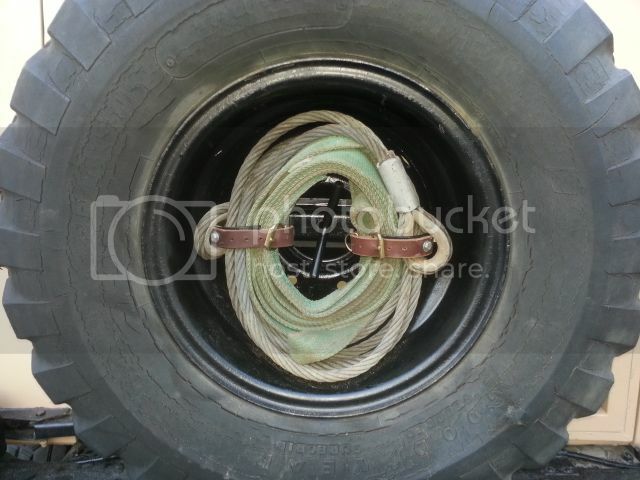 1" wide, just right to replace the belts that hold your tow cable inside your spare. Cut to length, bolt in place. Easy-peasy, lemon-squeezy. That is very nice. Looks good and authentic very Ingenious!!!! yes its looks to have a bunch of cracking. Last edited by mopar on Mon May 06, 2013 9:17 pm, edited 1 time in total. It's got a tube in it, and the ones I run on are much better, no dry rot. 5 new 900R16 STA Super Lugs in the fall.